KATHMANDU, June 10: The average length of stay of foreign tourists in Nepal has dropped to seven-year low to 12.6 days in 2018, according to a report entitled 'Nepal Tourism Statistics 2017' compiled by the Ministry of Culture, Tourism and Civil Aviation. As per the report, the average length of stay declined by six percent in 2017 compared to the average length of stay -- 13.4 days -- in 2016. The average length of stay was 13.16 days in 2015, 12.44 in 2014, 12.60 in 2013, 12.16 in 2012, 13.12 in 2011, and 12.67 in 2010. 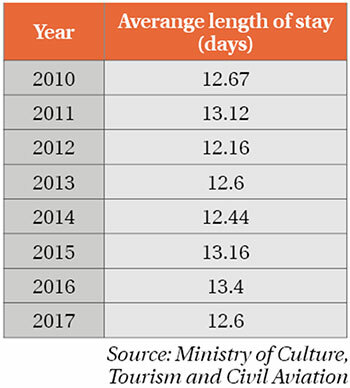 The drop in the average length of stay comes at a time when tourist arrival in the country is showing an upward trend. In 2017, the number of tourist arrival hit a record-high: 940,218. The government had targeted to increase the average length of stay to 14 days by 2017, according to the report. In the past, it has gone down to eight days at the minimum and up to 13.5 days at the maximum. The report analyzed the length of stay of 400,000 tourists to come up with the average figure for 2017. People come to Nepal for holiday pleasure, trekking & mountaineering, business, pilgrims, official work and others. As mentioned in the report, 70 percent of tourists visit Nepal for holiday, while eight percent come here for trekking & mountaineering, 15 percent for pilgrimage, and seven percent for other purposes. Despite the downward trend in length of tourists' stay, tourism entrepreneurs have said that the figure of 2017 was not so alarming. Talking to Republica, Bikram Pandey-Kaji, a campaigner for Buddhist circuit cross-border tourism, said that an increase in the number of tourists visiting under 5-4 day tour packages has lowered the average length of their stay in Nepal. “The data may change but the decline in the number is not so alarming,” he said. “The fluctuation in statistical calculation has occurred because of an increasing number of tourists visiting more than two places during one travel. So they have shorter stay in Nepal,” Pandey-Kaji said. Every year, Nepal receives Chinese and Indian tourists in the highest numbers. But they visit only for a short period of time. On the other hand, American tourists to Nepal may be lower in number, but they are the ones to stay longer in Nepal. “The highest numbers of visitors come from China and India, while the visitors from other countries are lower in number. Based on that the statistical calculation has fluctuated and this is just a small change,” Pandey-Kaji added. Likewise, Binayak Shah, general secretary of Hotel Association Nepal (HAN) has said that 2017 was a tough year in terms of infrastructure and tourism facilities. So, the number might have dropped slightly but there is nothing to worry about, according to him. “In any case, rather than the number of days, the amount they spend here matters more,” Shah added. In 2017, the average spending per tourist per day had increased to US$ 54 from $ 53 of the previous year.